Suggested Citation:"2 The Restoration Plan in Context." National Academies of Sciences, Engineering, and Medicine. 2016. Progress Toward Restoring the Everglades: The Sixth Biennial Review - 2016. Washington, DC: The National Academies Press. doi: 10.17226/23672. This chapter sets the stage for the sixth of this committee’s biennial assessments of restoration progress in the South Florida ecosystem. Background for understanding the project is provided through descriptions of the ecosystem decline, restoration goals, the needs of a restored ecosystem, and the specific activities of the restoration project. FIGURE 2-1 Water flow in the Everglades under (a) historical conditions, (b) current conditions, and (c) conditions envisioned upon completion of the Comprehensive Everglades Restoration Plan. SOURCE: Graphics provided by USACE, Jacksonville District. within the system and an increased susceptibility to drought and desiccation in the southern reaches of the Everglades (NRC, 2005). sulfur, mercury, and pesticides. Associated drainage and flood control structures, including the C&SF Project, have diverted large quantities of water to the coastal areas, thereby reducing the freshwater inflows and natural water storage that defined the ecosystem (see Figure 2-1b). The profound hydrologic alterations were accompanied by many changes in the biotic communities in the ecosystem, including reductions and changes in the composition, distribution, and abundance of the populations of wading birds. Today, the federal government has listed 78 plant and animal species in South Florida as threatened or endangered, with many more included on state lists. Some distinctive Everglades habitats, such as custard apple forests and peripheral wet prairie, have disappeared altogether, while other habitats are severely reduced in area (Davis and Ogden, 1994; Marshall et al., 2004). Approximately 1 million acres are contaminated with mercury (McPherson and Halley, 1996). Phosphorus from agricultural runoff has impacted water quality in large portions of the Everglades and has been particularly problematic in Lake Okeechobee (Flaig and Reddy, 1995) (see Chapter 3 for a more detailed discussion of phosphorus enrichment in the Everglades). The Caloosahatchee and St. Lucie estuaries, including parts of the Indian River Lagoon, have been greatly altered by high and extremely variable freshwater discharges that bring nutrients and contaminants and disrupt salinity regimes (Doering, 1996; Doering and Chamberlain, 1999). At least as early as the 1920s, private citizens were calling attention to the degradation of the Florida Everglades (Blake, 1980). However, by the time Marjory Stoneman Douglas’s classic book The Everglades: River of Grass was published in 1947 (the same year that Everglades National Park was dedicated), the South Florida ecosystem had already been altered extensively. Beginning in the 1970s, prompted by concerns about deteriorating conditions in Everglades National Park and other parts of the South Florida ecosystem, the public, as well as the federal and state governments, directed increased attention to the adverse ecological effects of the flood control and irrigation projects (Kiker et al., 2001; Perry, 2004). By the late 1980s it was clear that various minor corrective measures undertaken to remedy the situation were insufficient. As a result, a powerful political consensus developed among federal agencies, state agencies and commissions, Native American tribes, county governments, and conservation organizations that a large restoration effort was needed in the Everglades (Kiker et al., 2001). This recognition culminated in the Comprehensive Everglades Restoration Plan (CERP), which builds on other ongoing restoration activities of the state and federal governments to create one of the most ambitious and extensive restoration efforts in the nation’s history. Several goals have been articulated for the restoration of the South Florida ecosystem, reflecting the various restoration programs. The South Florida Ecosystem Restoration Task Force (hereafter, simply the Task Force), an intergovernmental body established to facilitate coordination in the restoration effort, has three broad strategic goals: (1) “get the water right,” (2) “restore, preserve, and protect natural habitats and species,” and (3) “foster compatibility of the built and natural systems” (SFERTF, 2000). These goals encompass, but are not limited to, the CERP. The Task Force works to coordinate and build consensus among the many non-CERP restoration initiatives that support these broad goals. The goal of the CERP, as stated in the Water Resources Development Act of 2000 (WRDA 2000), is “restoration, preservation, and protection of the South Florida Ecosystem while providing for other water-related needs of the region, including water supply and flood protection.” The Programmatic Regulations (33 CFR § 385.3) that guide implementation of the CERP further clarify this goal by defining restoration as “the recovery and protection of the South Florida ecosystem so that it once again achieves and sustains the essential hydrological and biological characteristics that defined the undisturbed South Florida ecosystem.” These defining characteristics include a large areal extent of interconnected wetlands, extremely low concentrations of nutrients in freshwater wetlands, sheet flow, healthy and productive estuaries, resilient plant communities, and an abundance of native wetland animals (DOI and USACE, 2005). Although development has permanently reduced the areal extent of the Everglades ecosystem, the CERP hopes to recover many of the Everglades’ original characteristics and natural ecosystem processes. At the same time, the CERP is charged to maintain levels of flood protection (as of 2000) and was designed to provide for other water-related needs, including water supply (DOI and USACE, 2005). the spatial extent and compartmentalization of the natural landscape (SFERTF, 2000; SSG, 1993). Implicit in the understanding of ecosystem restoration is the recognition that natural systems are self-designing and dynamic, and therefore, it is not possible to know in advance exactly what can or will be achieved. Thus, ecosystem restoration is an enterprise with some scientific uncertainty in methods or outcomes that requires continual testing of assumptions as well as monitoring and assessment of progress. This report discusses the challenges to restoration goals arising from major changes that have occurred since the inception of the CERP in 1999 (see Chapter 4). Additional challenges in defining and implementing restoration goals are discussed in the initial National Academies biennial review (NRC, 2007). Retention, improvement, and expansion of the full range of habitats by preventing further losses of critical wetland and estuarine habitats, and by protecting lands that could usefully be part of the restored ecosystem. If these five critical components of restoration are achieved and the difficult problem of invasive species can be managed, then the basic physical, chemical, and biological processes that created the historical Everglades can once again work to create and sustain a functional mosaic of biotic communities that resemble what was distinctive about the historical Everglades. The history of the Everglades and ongoing global climate change will make replication of the predrainage system impossible. Because of the historical changes that have occurred through engineered structures, urban development, introduced species, and other factors, the paths taken by the ecosystem and its components in response to restoration efforts will not retrace the paths taken to reach current conditions. End results will also often differ from the historical system as climate change and sea level rise, permanently established invasive species, and other factors have moved the ecosystem away from its historical state (Hiers et al., 2012). far more likely than if humans attempt to specify and manage every individual constituent and element of the ecological system (NRC, 2007). Several restoration programs, including the largest of the initiatives, the CERP, are now under way. The CERP often builds upon non-CERP activities (also called “foundation projects”), many of which are essential to the effectiveness of the CERP. The following section provides a brief overview of the CERP and some of the major non-CERP activities. WRDA 2000 authorized the CERP as the framework for modifying the C&SF Project. Considered a blueprint for the restoration of the South Florida ecosystem, the CERP is led by two organizations with considerable expertise managing the water resources of South Florida—the USACE, which built most of the canals and levees throughout the region, and the South Florida Water Management District (SFWMD), the state agency with primary responsibility for operating and maintaining this complicated water collection and distribution system. Conventional surface-water storage reservoirs. The Yellow Book includes plans for approximately 1.5 million acre-feet (AF) of surface storage, located north of Lake Okeechobee, in the St. Lucie and Caloosahatchee basins, in the EAA, and in Palm Beach, Broward, and Miami-Dade counties. Aquifer storage and recovery (ASR). The Yellow Book proposes to provide substantial water storage through ASR, a highly engineered approach that would use a large number of wells built around Lake Okeechobee, in Palm Beach County, and in the Caloosahatchee Basin to store water approximately 1,000 feet below ground. In-ground reservoirs. The Yellow Book proposes additional water storage in quarries created by rock mining. FIGURE 2-2 Major project components of the CERP. SOURCE: Courtesy of Laura Mahoney, USACE. Seepage management. The Yellow Book outlines seepage management projects to prevent unwanted loss of water from the remnant Everglades through levees and groundwater flow. The approaches include adding impermeable barriers to the levees, installing pumps near levees to redirect lost water back into the Everglades, and holding water levels higher in undeveloped areas between the Everglades and the developed lands to the east. Removing barriers to sheet flow. The CERP includes plans for removing 240 miles of levees and canals, to reestablish shallow sheet flow of water through the Everglades ecosystem. Rainfall-driven water management. The Yellow Book includes operational changes in the water delivery schedules to the WCAs and Everglades National Park to mimic more natural patterns of water delivery and flow through the system. Water reuse and conservation. To address shortfalls in water supply, the Yellow Book proposes two advanced wastewater treatment plants so that the reclaimed water could be discharged to wetlands along Biscayne Bay or used to recharge the Biscayne aquifer. The largest portion of the budget is devoted to storage projects (see Chapter 4) and to acquiring the lands needed for them (see NRC, 2005). 1 Although some STAs are included among CERP projects, USACE has clarified its policy on federal cost-sharing for water quality features. A memo from the Assistant Secretary of the Army (Civil Works) (USACE, 2007a) states: “Before there can be a Federal interest to cost share a WQ [water quality] improvement feature, the State must be in compliance with WQ standards for the current use of the water to be affected and the work proposed must be deemed essential to the Everglades restoration effort. . . . This determination must be based on some finding other than the project is a part of CERP and generally will aid the restoration effort.” The memo goes on to state, “the Yellow Book specifically envisioned that the State would be responsible for meeting water quality standards.” Therefore, it appears that until the water flowing into the project features meets existing water quality requirements or unless a special exemption is granted for projects deemed “essential to Everglades restoration,” the state is responsible for 100 percent of the costs of CERP water quality project features. the Department of Commerce, the Miccosukee Tribe of Indians of Florida, the Seminole Tribe of Florida, the Florida Department of Environmental Protection, and other federal, state, and local agencies (33 CFR Part 385). WRDA 2000 endorses the use of an adaptive management framework for the restoration process, and the Programmatic Regulations formally establish an adaptive management program that will “assess responses of the South Florida ecosystem to implementation of the Plan; . . . [and] seek continuous improvement of the Plan based upon new information resulting from changed or unforeseen circumstances, new scientific and technical information, new or updated modeling; information developed through the assessment principles contained in the Plan; and future authorized changes to the Plan.” An interagency body called Restoration, Coordination, and Verification (RECOVER) has been established to ensure that sound science is used in the restoration. The RECOVER leadership group oversees the monitoring and assessment program that will evaluate the progress of the CERP toward restoring the natural system and will assess the need for changes to the plan through the adaptive management process (see also Chapter 5). When Congress authorized the CERP in WRDA 2000, the SFWMD, the USACE, the National Park Service, and the U.S. Fish and Wildlife Service were already implementing several activities intended to restore key aspects of the Everglades ecosystem. These non-CERP initiatives are critical to the overall restoration progress. In fact, the CERP’s effectiveness was predicated upon the completion of many of these projects, which include Modified Water Deliveries to Everglades National Park (Mod Waters), C-111 South Dade, and state water quality treatment projects (see Box 2-1). Several additional projects are also under way to meet the broad restoration goals for the South Florida ecosystem and associated legislative mandates. They include extensive water quality treatment initiatives and programs to establish best management practices (BMPs) to reduce nutrient loading. The following represent the major non-CERP initiatives currently under way in support of the South Florida ecosystem restoration (Figure 2-1-1). FIGURE 2-1-1 Locations of major non-CERP initiatives. SOURCE: © International Mapping Associates. thereby restoring over 40 miles of meandering river channel in the Kissimmee River. The project includes a comprehensive evaluation program to track ecological responses to restoration (Jones et al., 2014). See also Chapter 3. The Everglades Forever Act (Fla. Stat. § 373.4592) required the State of Florida to construct stormwater treatment areas (STAs) to reduce the loading of phosphorus into the Arthur R. Marshall Loxahatchee National Wildlife Refuge (LNWR), the WCAs, and Everglades National Park. As part of the state’s Everglades Construction Project and long-term plan for meeting the total phosphorus criterion for the Everglades Protection Area of 10 parts per billion (ppb), the SFWMD constructed 57,000 acres of STAs between 1993 and 2012. In 2012, after continued violations of water quality standards, the state and the Environmental Protection Agency agreed upon a new Restoration Strategies Regional Water Quality Plan that includes an additional 6,500 acres of STAs and 116,000 acres of flow equalization basins (see Chapter 3). This project is designed to improve hydrologic conditions in Taylor Slough and the Rocky Glades of the eastern panhandle of Everglades National Park and to increase freshwater flows to northeast Florida Bay, while maintaining flood protection for urban and agricultural development in south Miami-Dade County. The project plan includes a tieback levee with pumps to capture groundwater seepage to the east, detention areas to increase groundwater levels and thereby enhance flow into Everglades National Park, and backfilling or plugging several canals in the area. A combined operational plan (COP) will integrate the goals of the Mod Waters and C-111 projects and increase the quantity of water entering Everglades National Park. See also Chapter 3.
to complete all the original tasks, the program led to increased state investment and expedited project construction timelines for several CERP projects. Operation of Lake Okeechobee has been modified twice since the CERP was developed in ways that have reduced total storage. In April 2000, the Water Supply and Environment (WSE) regulation schedule was implemented to reduce high water impacts on the lake’s littoral zone and to reduce harmful high discharges to the St. Lucie and Caloosahatchee estuaries. The regulation schedule was changed again in 2008 to reduce the risk of failure of the Herbert Hoover Dike until the USACE could make critical repairs. This resulted in a loss of 564,000 AF of potential storage from the regional system (see Chapter 4). tions and installation of a seepage control pump to increase water flow into northeastern portions of Everglades National Park. It also includes providing flood mitigation to the 8.5-square-mile area (a low-lying but partially developed area on the northeast corner of Everglades National Park) and raising portions of the Tamiami Trail. Mod Waters is a prerequisite for the first phase of decompartmentalization (i.e., removing some barriers to sheet flow), which is part of the CERP (DOI and USACE, 2005; NRC, 2008). See also Chapter 3. In 2007, the Florida legislature expanded the Lake Okeechobee Protection Act (LOPA) to include protection and restoration of the Lake Okeechobee watershed and the Caloosahatchee and St. Lucie estuaries. The legislation, being implemented as the Northern Everglades and Estuaries Protection Program, will focus resources on restoration efforts for Lake Okeechobee and the Caloosahatchee and St. Lucie estuaries. The Lake Okeechobee Watershed Construction Project Phase II Technical Plan, issued in February 2008 in accordance with LOPA, consolidated the numerous initiatives already under way. Congress gave programmatic authority for the Everglades and South Florida Ecosystem Restoration Critical Projects in Water Resources Development Act of 1996 (WRDA 1996), with modification in WRDA 1999 and WRDA 2007. These were small projects that could be quickly implemented to provide immediate and substantial restoration benefits such as improved quality of water discharged into WCA-3A and Lake Okeechobee and more natural water flows to estuaries. Examples of the Critical Projects include the Florida Keys Carrying Capacity Study, Lake Okeechobee Water Retention and Phosphorus Removal, Seminole Tribe Big Cypress Water Conservation Plan, Tamiami Trail Culverts, Ten Mile Creek Water Preserve Area, and the Lake Trafford Restoration (DOI and USACE, 2011). East Coast. The Florida Department of Environmental Protection (2015) recently released a study with a series of recommendations to reduce the barriers to the use of reclaimed water and stormwater to augment water supply and help meet growing urban and industrial water demands. It remains unclear whether or how these new initiatives and mandates will affect the expectations for agricultural and urban water supply from the CERP, particularly since the capture of excess surface water is a key element of the CERP. In 2008, Governor Charlie Crist announced the planned acquisition of 187,000 acres of agricultural land from the U.S. Sugar Corporation to maximize restoration opportunities for the South Florida ecosystem. The SFWMD subsequently launched the River of Grass public planning process to facilitate agency and stakeholder input on future uses of the new lands for restoration. Phase II of the planning process was halted in May 2010, without completion. In October 2010, the SFWMD closed on the purchase of 26,800 acres of the U.S. Sugar land for approximately $197 million, and in May 2015, the SFWMD governing board terminated the 10-year option to acquire an additional 153,000 additional acres of the U.S. Sugar land. 2 The WQBEL is a numeric discharge limit used to regulate permitted discharges from the STAs so as not to exceed a long-term geometric mean of 10 μg/L within the Everglades Protection Area. This numeric value is translated into a flow-weighted mean (FWM) total phosphorus (TP) concentration and applied to each STA discharge points, which must meet the following: (1) the STAs are in compliance with WQBEL when the TP concentration of STA discharge point does not exceed an annual FWM of 13 μg/L in more than three out of five years, and (2) annual FWM of 19 μg/L in any water year (Leeds, 2014). lights key areas of knowledge gained, including predrainage hydrology, modeling, and Everglades landscapes. Considering the many advances in knowledge since 1999, climate change and sea level rise are among the most significant. As outlined in NRC (2014), changes in precipitation and evapotranspiration are expected to have substantial impacts on CERP outcomes. Downscaled precipitation projections remain uncertain and range from modest increases to sizeable decreases for South Florida, and research continues locally and nationally to improve these projections. Sea level rise is already affecting the distribution of Everglades habitats and causing coastal flooding in some low-lying urban areas. CERP planners are now evaluating all future restoration benefits in the context of low, medium, and high sea level rise projections, although NRC (2014) noted the need for greater consideration of climate change and sea level rise in CERP project and program planning. See Chapter 4 for additional discussion of the implications of new knowledge of climate change to the CERP. Since the CERP was developed, the significance of invasive species management on the success of restoration also has been recognized by the South Florida Ecosystem Restoration Task Force and its member agencies.3 Non-native species constitute a substantial proportion of the current biota of the Everglades. The approximately 250 non-native plants species are about 16 percent of the regional flora (see NRC, 2014). Southern Florida has a subtropical climate with habitats that are similar to those from which many of the invaders originate, with relatively few native species in many taxa to compete with introduced ones. Some species, especially of introduced vascular plants and reptiles, have had dramatic effects on the structure and functioning of Everglades ecosystems, and necessitate aggressive management and early detection of new high-risk invaders to ensure that ongoing CERP efforts to “get the water right” allow native species to prosper instead of simply enhancing conditions for invasive species. The 2015-2016 period included both localized droughts in the summer of 2015 that triggered seagrass die-off in Florida Bay and record rainfall the following winter, which led to large releases to the Caloosahatchee and St. Lucie Estuaries, high water conditions in the Water Conservation Areas, and harmful algal blooms during the summer of 2016. Both events highlight the limitations of existing infrastructure and water management options to reduce the adverse impacts of low and high water conditions. Florida Bay is an important nursery for commercially or recreationally important fish and invertebrate species. The bay, which covers about 850 mi2 (2,200 km2), is shallow (< 9 ft or 3 m) and is divided by mud banks into somewhat isolated basins in the central and eastern parts of the bay (Fourqurean and Robblee, 1999; NRC, 2002a). In the mid- to late 1900s, Florida Bay was characterized as having clear water and dense seagrasss meadows, but in 1987, hypersaline conditions resulting from chronic and acute shortages of freshwater inflows triggered a cascade of ecological effects in the bay. Together with high temperatures, the hypersaline conditions caused hypoxic conditions and high sulfide levels that caused widespread seagrass collapse in the central and western portions of the bay, algal blooms, and increased turbidity (Deis, 2011; Hall et al., 1999) with major effects on commercial and recreational fishing. Although the most acute impacts lasted between 1987 and 1991, the ecosystem was still recovering as of the mid-2000s (J. Fourqurean, FIU, personal communication, 2015). In 2015, a seagrass die-off (Figure 2-3) was again observed in several locations in the bay. The 2015 seagrass die-off was attributed to local rainfall deficits associated with a strong El Niño which, in addition to the chronic shortage of freshwater deliveries, led to increased salinity in the bay (up to 72 practical salinity units [psu] in Garfield Bight, the highest salinity yet recorded in the bay) (NPS, 2016a). By late 2015, the spatial extents of seagrass die-off included areas such as Johnson Key, Rankin Lake, Pelican Key, Dido Key Bank, and Garfield Bight (NPS, 2016a). In the 1980s, the collapse of Florida Bay brought increased scientific, public, and political attention to the conditions of the Greater Everglades ecosystem and support for restoration actions to increase flows to and restore conditions in Everglades National Park and Florida Bay. Twentieth-century water management in South Florida had decreased freshwater inflow to the bay by about 60 percent compared to predrainage conditions, while altering the distribution and timing of that water (Herbert et al., 2011). CERP and non-CERP projects (e.g., C-111 Spreader Canal Western Project, C-111 South Dade), were authorized and constructed to help restore freshwater flows to Taylor Slough and Florida Bay, but as of 2015, flow restoration implementation was insufficient to prevent a recent reoccurrence of seagrass die-off. The status of these and other projects designed to enhance flow to Florida Bay is discussed further in Chapter 3. FIGURE 2-3 Seagrass die-off in Florida Bay in 2015. SOURCE: J. Fourqurean, FIU, personal communication, 2015. (D. Rudnick, Everglades National Park, personal communication, 2016). Monitoring of the seagrass and water chemistry in Florida Bay continues (NPS, 2016a). In contrast to the local drought conditions of 2015, the Everglades ecosystem experienced unseasonably high rainfall and extreme high water levels in early 2016, which caused difficult operational challenges for water managers. The November 2015 through January 2016 period (normally the dry season) was the wettest on record, caused in part by a strong El Niño. Above-average rainfall also fell in May 2016, again raising concerns about high water levels in Lake Okeechobee at what is typically the start of the wet season. water conditions. The CERP and other non-CERP projects help address some, but not all, of these constraints. Currently, high water levels (above 17.25 feet National Geodetic Vertical Datum [NGVD] 1929) cannot be maintained in Lake Okeechobee due to the risk of structural failure of the Herbert Hoover Dike, which is being rehabilitated (USACE, 2008). Inflow capacity to the lake far exceeds the outflow capacity, and water levels can rise quickly to dangerous levels during periods of heavy rain. Therefore, lake levels must be managed carefully to protect public safety. By mid-February 2016, water levels in Lake Okeechobee were reaching dangerously high water levels (above 16 ft NGVD and still rising4), and all existing water storage facilities were at capacity (Staletovich, 2016). To reduce water levels in the lake, water was discharged to the northern estuaries and to other canals at their conveyance capacity, although there was substantial public concern over the high-volume discharges and the accompanying nutrient and sediment loads that are damaging to the estuary ecosystems. Fish kills and algal blooms occurred under similar conditions during 1998 and more recently in 2013 and ultimately occurred during the summer of 2016 (see Box 2-2) (Staletovich, 2016). STA capacity typically limits the amount of water that can be discharged to the Water Conservation Areas, but during much of this period, the water levels in the WCAs were above their regulation schedules and had no capacity to receive more water. Limited capacity existed for discharging water south out of the WCAs based on the conveyance capacities of existing structures, restrictions on the use of the S-12 structures at the southern end of WCA-3A to protect the Cape Sable seaside sparrow, and limitations on water levels in the L-29 canal as part of a phased operations plan for moving water under the new Tamiami Trail 1-mile bridge (J. Mitnik, SFWMD, personal communication, 2016; see also Chapter 3). Despite these constraints, at the urging of Florida’s governor, water managers took creative actions to limit water releases to the St. Lucie and Caloosahatchee estuaries and help alleviate flooding in the Water Conservation Areas (Staletovich, 2016). Several short-term emergency operation deviations were developed to move water out of the WCAs, including increasing water levels in the L-29 canal to increase the flow under the 1-mile bridge into Northeast Shark River Slough and moving water into Big Cypress National Preserve (SFWMD, 2016a). The limitations of the current water management system compromised the emergency deviation plan as well, as water had to be temporarily released through the S-12 structures to avoid overtopping during the prescribed seasonal closure period for protection of the sparrow (FWS, 2016), and thus ultimately efforts to protect the sparrow failed. FIGURE 2-2-1 Cyanobacteria bloom in Lake Okeechobee, July 2016.
risks to wildlife and to human health (Falconer, 2008; Pilotto, 2008). Why do blooms of Microcystis occur in Lake Okeechobee? The foundational reason is that the lake receives large amounts of nitrogen and phosphorus from its tributaries and has high levels of those nutrients in the water column to support the growth of phytoplankton. Dissolved phosphorus in the lake results from large watershed inputs and also from internal recycling of sediment-associated phosphorus (Havens et al., 2007). However, external inputs of nitrogen are also needed to support cyanobacteria blooms, because the residence time of nitrogen in a eutrophic lake is relatively short, with considerable losses into the atmosphere by denitrification (McCarthy et al., 2007). Cyanobacteria always are present in Lake Okeechobee but they normally do not bloom in the pelagic zone because their growth is suppressed by light limitation (Phlips et al., 1993). Periodically the weather is just right and there are hot calm days when a sufficient amount of light-blocking sediment particles sink from the water to allow rapid phytoplankton growth. Microcystis is well-suited to take advantage of such conditions, and it rapidly proliferates near the water surface (Havens et al., 1998). In September 2004, two hurricanes passed directly over Lake Okeechobee, and the lake received large inflows and inputs of nitrogen and phosphorus, and high winds resulted in massive resuspension of bottom sediments (Havens et al., 2011, 2016). When turbidity declined in the lake in the summer of 2005, an intense Microcystis bloom occurred. What causes Microcystis blooms in the St. Lucie Estuary? Phlips et al. (2012) found that internally driven blooms are mainly limited to the north fork of the St. Lucie Estuary and occur during dry periods when water residence time is long enough to allow the algae to proliferate. Those blooms are mainly caused by a kind of algae called a dinoflagellate. In contrast, externally driven blooms are much more severe, happen in the main stem of the estuary, and are caused by Microcystis. Phlips et al. (2012) documented that the 2005 algal bloom, which coincided with regulatory water discharges from the lake, was seeded by an upstream bloom that happened in Lake Okeechobee. Concentrations of the toxin microcystin exceeded 1,000 micrograms per liter in the St. Lucie Estuary (compared to below 10 as a typical background level). They noted that seeding of estuaries from nutrient-polluted upstream sources is a worldwide problem (Paerl, 1988). It is highly likely that the same situation occurred in 2016. The algal blooms in Lake Okeechobee and the St. Lucie Estuary illustrate why it is critical to reduce both nitrogen and phosphorus inputs to Lake Okeechobee to reduce the occurrence of toxic blooms and to establish sufficient regional water storage options so that regulatory releases from the lake do not impact the estuary. Climate change has the potential to make the situation of harmful algal blooms worse, because it has been established that enrichment by nitrogen and phosphorus plus warming synergistically favor cyanobacteria in lakes around the world (Conley et al., 2009, Havens and Paerl, 2015, Paerl et al., 2016a). At low to moderate nitrogen and phosphorus concentrations, warming of 2-3 degrees Celsius does not result in an appreciable increase in the risk of cyanobacteria blooms. However, at high levels of nitrogen and phosphorus enrichment, there is an unpredictable non-linear increase in risk with the same magnitude rise in temperature (Havens and Paerl, 2015). 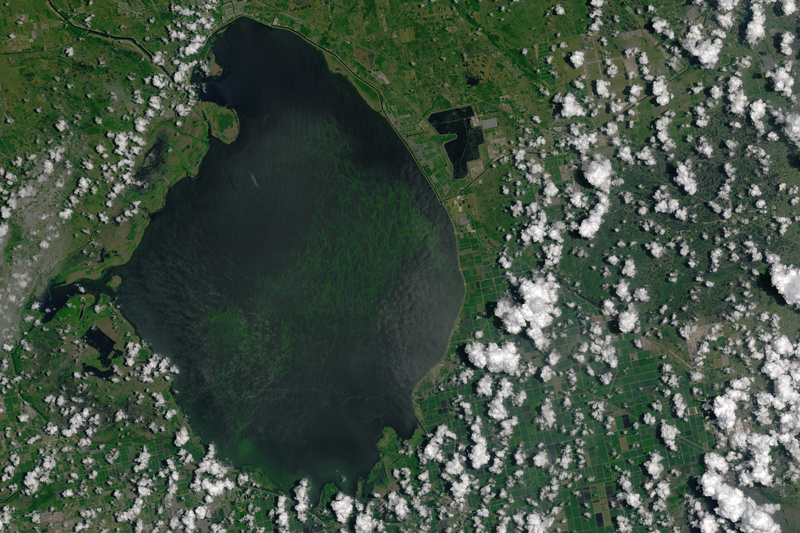 Thus, it will be more challenging to predict and control cyanobacteria blooms in a warmer future, but actions today to substantively reduce nitrogen and phosphorus concentrations in lakes can help to ward off future extreme events such as that which occurred in Lake Okeechobee in the summer of 2016. A similar situation occurred in the late 1990s after Hurricane Irene and associated heavy rainfall resulted in extreme high water levels in the lake, leading to a decision by the SFWMD and the USACE to make emergency water releases from the lake in spring 2000. Water releases were made primarily to the St. Lucie and Caloosahatchee estuaries because of conveyance and other constraints to sending water south. Large releases of water from the lake5 lasted for 27 days (Steinman et al., 2002). The decision to make emergency water releases was largely a response to documented damaging effects of high water on the lake’s littoral zone (Havens et al. 2001), and involved a rapid drawdown to allow submerged vegetation to recover (Steinman et al., 2002). Monitoring of the St. Lucie and Caloosahatchee estuaries during the period of emergency water releases indicated immediate negative impacts including increased turbidity and reduced salinity. The St. Lucie estuary recovered quickly after the releases ended, but recovery of the Caloosahatchee estuary was slower due to death of seagrass beds during the event. A cyanobacteria bloom also occurred in the upper St. Lucie estuary, but ended when the releases of lake water stopped (Steinman et al., 2002). Overall, the high-water events of 2016 provide a harsh reminder that water storage remains inadequate to address devastating high water events in the northern estuaries and illuminate the many constraints that still exist in the system that limit conveyance of water south into the remnant Everglades. Even after 16 years of the CERP, little progress has been made in resolving these well-known constraints. Short-term emergency deviations helped mitigate the impacts, but further progress on CERP and non-CERP projects are needed to provide long-term solutions to such challenges by providing more storage and moving more of the floodwaters south, into and through the Everglades. 5 Typical discharge rates during the emergency event were 2,000 to 2,700 cfs to the St. Lucie estuary and 4,000 to 4,500 cfs to the Caloosahatchee River estuary. to adapt. The seagrass die-offs in Florida Bay in 2015 and the extreme high-water events and associated algal blooms in 2016, however, provide continued reminders of why substantial restoration progress is needed. Implementation progress is discussed in detail in Chapter 3.